Douglas Coupland is a completely unique writer who delves into the social structures of the tech world centered around Silicon Valley around the time of the doc com bubble. Microserfs is the story of a group of Microsoft developers living together in a “nerd house” who collectively decided to move to Silicon Valley and start their own programming project called OOP (a reference to object-oriented programming ). OOP is a design program that uses lego-like blocks to create digital structures. Eventually their headquarters coms to be made entirely of legos and with this in mind it was hard not to use legos for my cover (especially since I happen to have a box of them under my couch). As it turns out, good looking letters are difficult to make from legos (especially M’s). 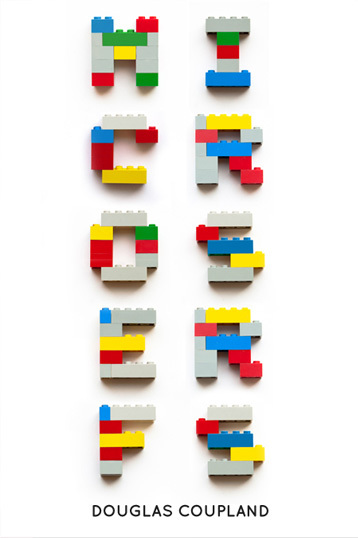 The mainly primary colors of the blocks made for a nice and bold cover and the rounded typeface called Quicksand used for the author’s name is a nod to the Lego logo itself. I highly recommend picking up a copy if you’re into techie folklore and reading about where it all began.